Start by playing a 6v4 in one half with the two remaining players (accomplices) from team playing four (red) waiting in the other half. The aim is for the team with six players (white) to keep possession as long as possible. The opposing team with four players (red) attempts to win control rather than just knock the ball out. As soon as they win control they look to play the ball between the poles (prison bars) towards their two ‘accomplices’. Once the ball is received by the accomplices, their remaining four team mates ‘escape’ into the same half. Four of the guards (white team) follow and the situation reverses. The ball must remain on the ground at all times. A point is scored for every successful breakout. Possession play and counter attack. Anticipation, patience, interception, movement and quick, accurate passing. When the defending team (red) wins possession it attempts to play the ball to the accomplices. 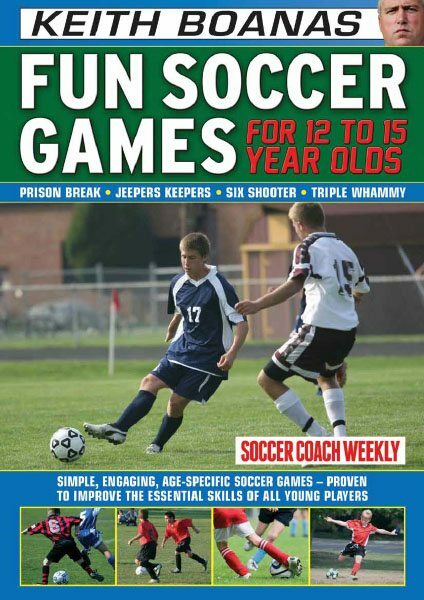 Develop the game by allowing one player to run through the bars to their accomplices. Develop further by playing 1v1 in one half and even teams in the other after, say, three passes. One of the four can run the ball through the bars if possible. You can also limit the number of touches to two or three to help the four defenders close down the team in possession. Play even numbers in one half and 1v1 in the other. After a set amount of passes, e.g. three, the team in possession can pass through the bars. The team should run through the bars and move as quickly as possible to support. Teams score a point each time they pass through the bars. First to score six points wins. Use smaller of bigger gaps between the bars in order to change the difficulty.